Gene Ludwig - Love Notes of Cole Porter - $14.99 : The Big O Store, Small label, big sound! I want the BONUS 45RPM single! Gene passed away suddenly on July 14, 2010. Love Notes of Cole Porter represents his last recording session. Tracked in 2008 with a cast of stellar Pittsburgh musicians, it also represents a concept that Gene held dear to his heart; covering some of the incredible songs of Cole Porter, one of Gene's favorite composers, timeless songs written during the golden age of the Great American Songbook era. His loving wife Pattye knew that Gene would want this album to be heard as his swan song and worked tirelessly to produce it for release. In that spirit, Big O Records is proud to issue one of Gene's finest recordings. Gene's style always belied his gentle demeanor. He may look harmless at first glance, but when he sat down behind the Hammond B3 organ, nothing but fire and intensity spun out of the Leslie speaker like a preacher spreading his message of joy and hope to the jazz organ faithful. We are lucky to have this last gift of music from a true master of the Hammond B3. 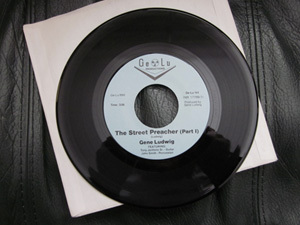 As a special bonus, for just $2 more your order will include a collectible virgin copy of Gene's single Street Preacher pt I & II, originally self-released in 1987 on the Ge-Lu record label. Again, these are unplayed, original 45rpm singles in their original sleeves.